For every action there is an equal and opposite reaction, right? 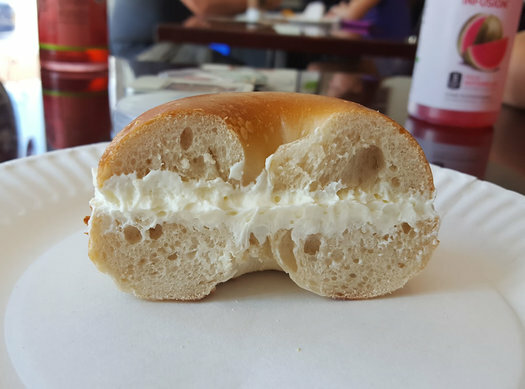 So it's no surprise that for as much attention as "mindful" or "healthy" eating receives, things like over-the-top bagels exist. 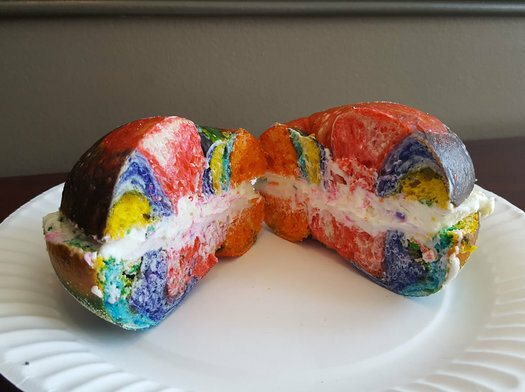 Social media was stormed by the rainbow bagel phenom out of New York City, and now we have our own version, too -- the beast that is the wagel bagel at West End Bagels. 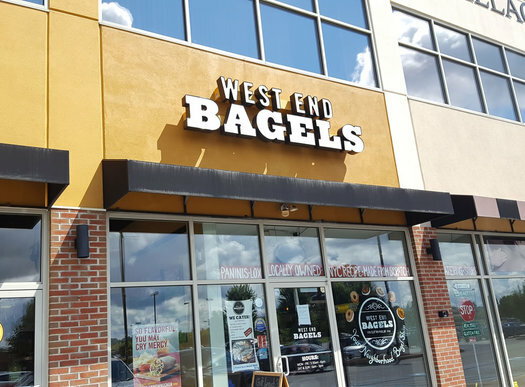 West End Bagels, located in the Clifton Park Commons, could be easily mistaken for a chain, but it's locally owned with on-premises prep and baking of the bagels. The bagel itself tastes like, well, a bagel. The vegetable-based food dye does not affect the taste of the bagel, which had a slightly sour taste and tender crumb. 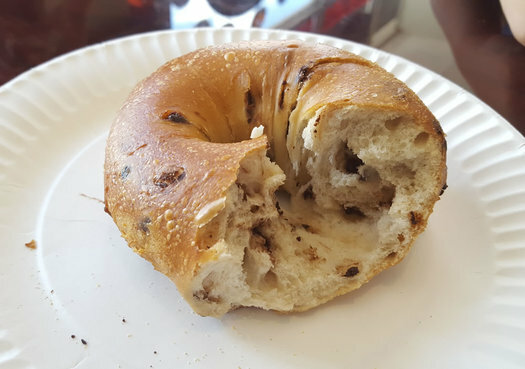 The outer crust is pocked and blistered and crackles just a bit under the teeth, but overall the bagel is airy and chewy and only slightly toothsome. The funfetti cream cheese, which is the natural pairing for the multi-hued bagel, has the tang of cream cheese but tastes shockingly exactly like raw yellow cake batter. It's a wonder how akin it is to licking the spoon. Pink, yellow, and blue sprinkles and folded into the cream cheese and subtly dissolve so eliminate any crunchy bits in this pseudo-frosting. Three bagels, two with cream cheese and one plain, a medium cup of coffee, and two gem-colored bottled drinks from the cooler that my kids said were "healthful" but probably weren't came to $16 and change. The line is never long but always constant, and popular bagels (like the wagel) tend to sell out early in the day.